Of course, Maldon salt is well-stocked at King, which opens today in New York City from protégés of legendary London chefs Ruth Rogers and the late Rose Gray. Annie Shi arrived alone and still in her finance suit for lunch nearly two years ago at The River Café, the storied Italian restaurant from Ruth Rogers and the late Rose Gray in London. “I remember she was at table six,” Jess Shadbolt, then a cook at the time, remembers. “She had the beef carpaccio first, then vongole padella,” Clare de Boer chimes in. “And three scoops of ice cream and a tart,” Shi says. “Then we sat outside and made notes about the restaurant we were going to open,” de Boer finishes. 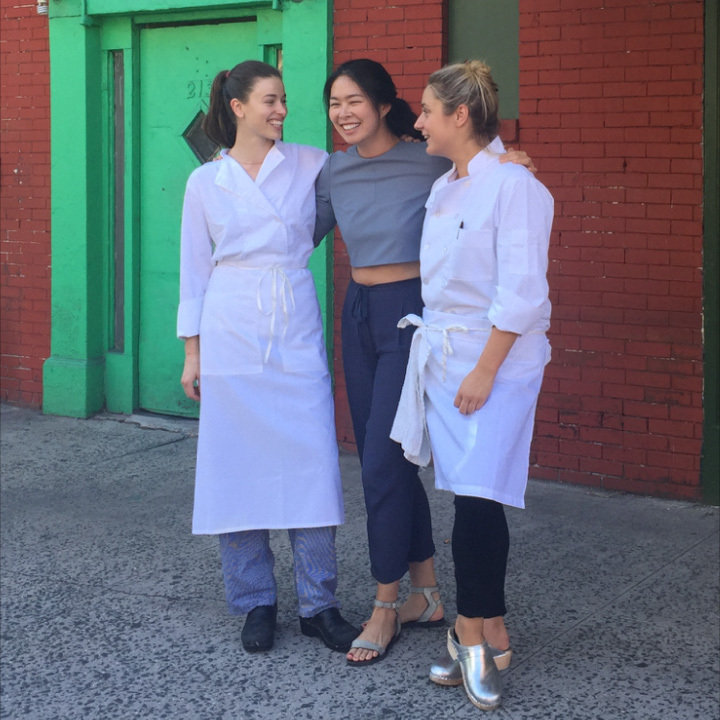 Today, the three women open up that restaurant, dubbed King, on the corner of Sixth Avenue and King Street in New York City after years of testing dishes at supper club pop-ups in London and searching for a space in NYC. A mutual friend set up Shi and de Boer when Shi first moved to London for work, and after bonding over dinner at Duck Soup in Soho, the two became bent on opening a restaurant together. That fateful lunch at The River Café sealed it with Shadbolt. Echoes of their supper club appear on the menu, like the first dish pissaladière. However, the focus of King's menu is hyperlocal to tiny destinations across Europe. “We learned that in Italy and France, it isn’t just region to region, but it’s village to village and family to family,” Shadbolt says. Though the Provençal fish stew (dolloped with saffron aioli and pudgy malfatti coated in butter and marjoram) may not always be on the menu, Shadbolt and de Boer are always stocked with certain cult pantry items. “That’s the crux of our cooking and the real heart of southern French and Italian style,” Shadbolt says. “It’s like nectar.” Their go-to is Capezzana, made from single-estate olives harvested on the first of November. “If you have that, you can make anything,” Shadbolt says. She turns day-old bread into crumbs and constantly relies on them for peasant-y tomato soup with a bit of basil or wintry ribollita. “Essential,” Shadbolt pronounces. She grew up close to Maldon's salt fields in Essex, and loves the big, fat, crunchy flakes. “You can’t leave home without Maldon,” de Boer says.